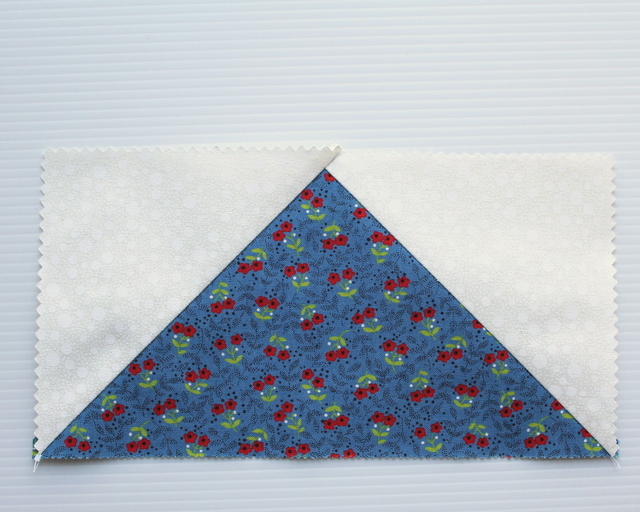 Last week a lovely reader named Linda asked me about the Flying Geese patchwork. She was looking for a tutorial and having trouble finding one. 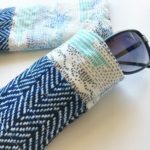 So I thought I’d help her out with a little step-by-step, a sizing chart and some ideas on how to join the basic Flying Geese unit into blocks for your quilt. 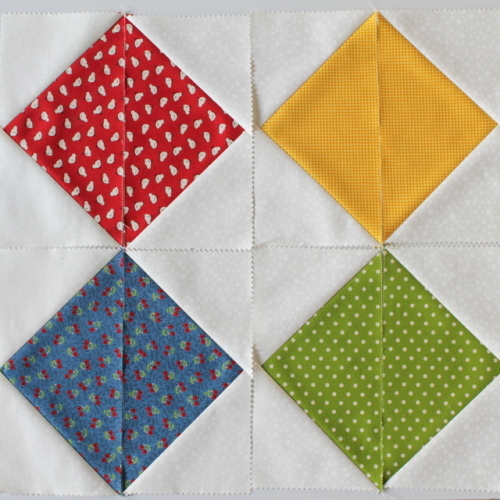 My Flying Geese units have been made using some cream charm squares (5″ x 5″) and layer cake squares divided in half then trimmed slightly to 5″ x 9.5″. Note: The rectangle piece is cut the same height as the square. The width is twice the square size minus half an inch. 1. On the back (wrong side) of the two squares, draw a line from corner to corner. I just use a biro but you could use any type of marker. The line will end up under the stitching so you won’t see it when you’re finished. 2. Place one square right sides together on the rectangle piece as pictured. Check that you have the line going from the bottom corner to the middle top. 3. Sew along the line you drew earlier. 4. 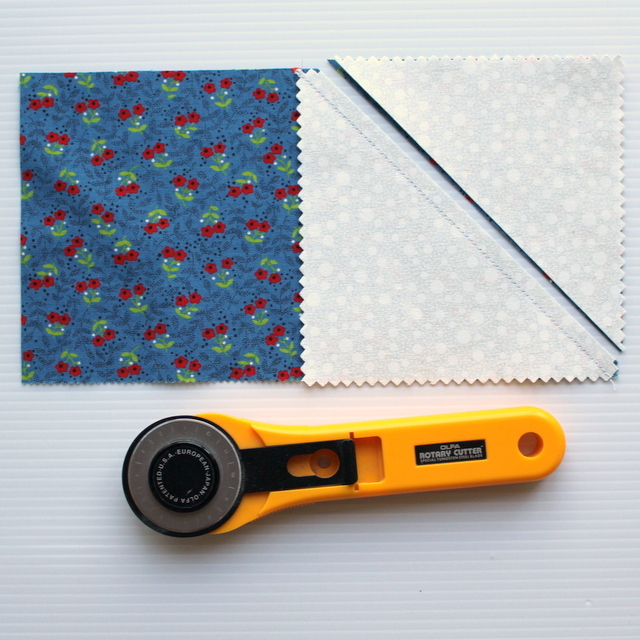 Trim the excess fabric from the corner leaving a quarter-inch seam. 5. Press the triangle open. 6. Place the second square right sides together on the other end of the rectangle (as pictured). Again the line starts at the bottom corner and goes to the centre top. It will slightly overlap the first triangle. 7. 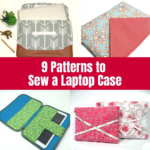 Sew along the line. 8. Trim the excess fabric and press open. This is the Flying Geese block all done. 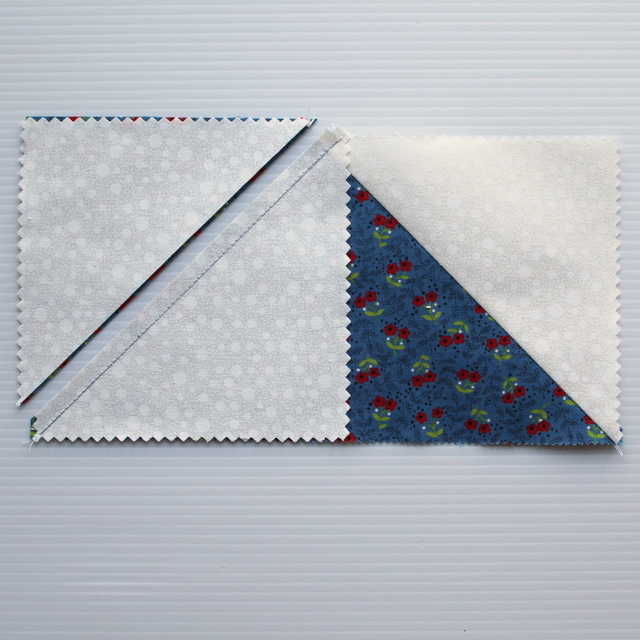 Where the triangles overlap at the top will become lost in your quarter-inch seam when you join this unit to others creating a perfect point. 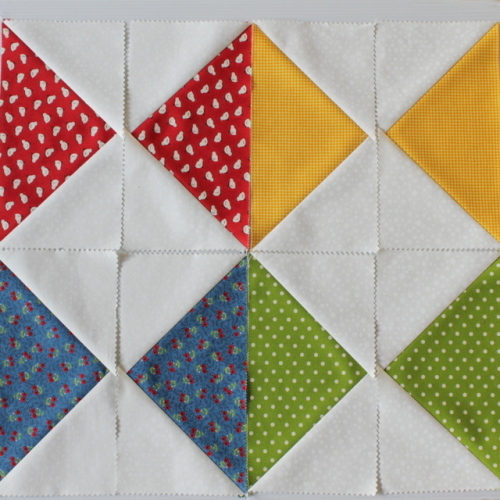 Once you have made some Flying Geese, you can join them in any combination you wish to create blocks. In my first picture above, you can see them joined in a row. 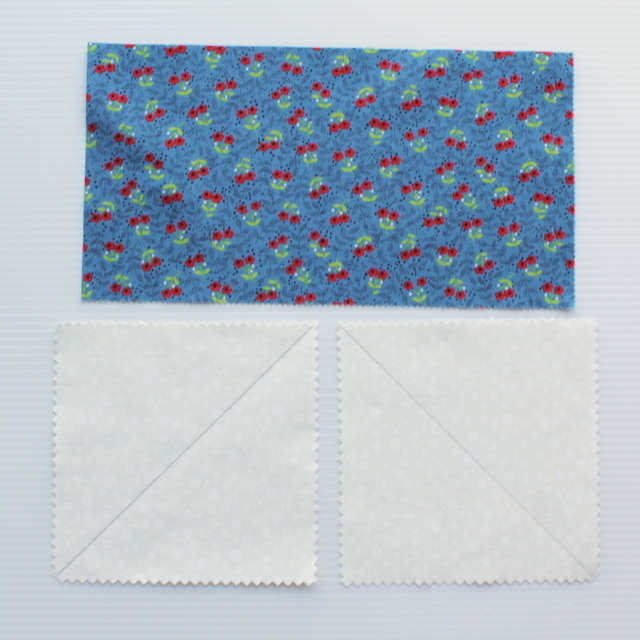 Here are some more options – keeping in mind that I have just laid these out to take photos and not actually joined them. once they are joined the points will be perfect and the size slightly smaller. You can also combine these units with plain rectangle blocks or square blocks to create other blocks. You are a gem thank you for that size chart. That makes things much easier . A HUGE big Thank You to you!!! I really appreciate what you have shown, I copied & pasted this tutorial & printed it out. You have done a great job, so easily explained. I appreciate all that you do for your readers & me. You will never really know how much I do appreciate this tute, I know that taking the pictues & explaining how to do this, took a lot of time & work. God Bless You!!! 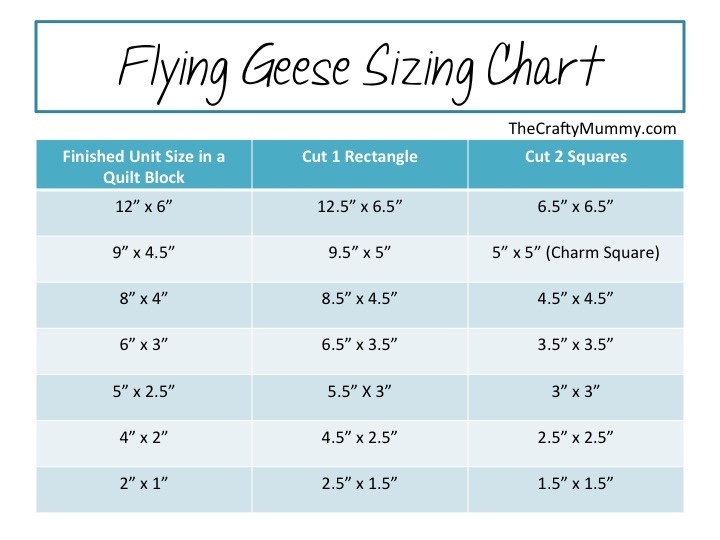 Thank you for the info on the different sizes on the flying geese blocks. Going to use as border on a baby quilt. Thank you for the helpful tutuorial. What do you do with the extra pieces? 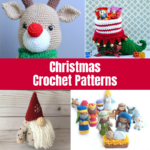 Do you have any project ideas for the scraps?